Guts2Glory shared Toowoomba's Bad Parkers & Drivers's photo. 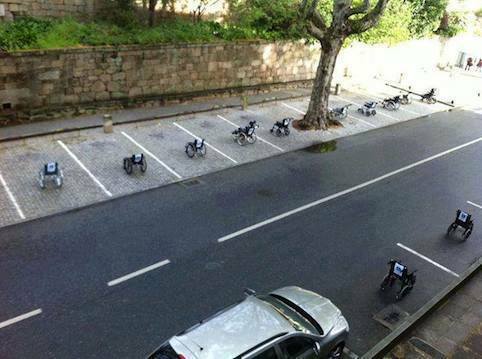 A few days ago in a parking lot in Lisbon wheelchair users and volunteers occupied all the available Non Handicap spaces to make a point to able body motorists what it is like to have "their" parking places unavailable to them. On every wheelchair various notes were left like "be right back", "it only takes a moment", "I'm get something here", etc. It would be wonderful to do this at all shopping centres with about 300 chairs during the entire Christmas Week to get the point across to them. Please Share this post to send it around the world. It's time for more action like this. Thank You Kindly. Thanks Roxi.